I've said it before and I'll say it again: I've written so much about the Spongetones, I often wonder what I'm going to write the next time they release a record. I mean, what more is there to say? How many ways can you say "Great album!" There. It's finally out of my system. On to the next round. Well, thankfully the Spongetones always up the ante. This time around, on the follow-up to the hall-of-fame-worthy Too Clever By Half, a kind-of White Album tour de force, the band has put the focus on the power in power pop and brought guitarist Pat Walters into the spotlight, but don't fret: Steve Stoeckel's Beatle-esque bass; Jamie Hoover's journeyman, no-instrument-off-limits prowess, and Rob Thorne's drums 'n' percussion mastery are all in full force. Speaking of Thorne, he hits the skins with the artistry of a Renaissance painter, if said painter were applying brush strokes with a cannon (see below). 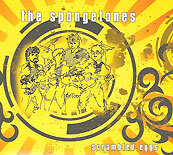 Scrambled Eggs is a hard hitting serving of your daily requirement of vitamin P, another sterling addition to the ear-popping, long-playing resume of one of pop's top bands. Frankly, it's a corker. First shot out of the box, Thorne's drums fire away thunderously, splitting atoms with wild abandon as Eggs' opening salvo, "All the Loving," gets the proceedings cooking. This is beat music, '09 style, a Cavern-esque chiller, a dance floor thumper infused with energy, kept moving with the precise timekeeping that has become Thorne's hallmark. The drummer's fills, particularly at 3:40, as the vocal harmonies extend and expand, delight and amaze, as do his propulsive skins and short, sharp shocks of snare hits that keep Stoeckel's ace "Talking Around It" moving as if it were trying to outrun a speeding ticket. His emotional, bluesy playing on Hoover and Stoeckel's "Tough Love" is positively chilling, as the "I Want You (She's So Heavy)" groove takes flight. Speaking of being airborne, welcome to the friendly pop skies the enhanced presence of Pat Walters, who shares writing credit on no less than four songs and takes the solo reigns on the country-tinged, toe-tapping delight, "Karma Depleted," with its infectious monosyllabic chorus. 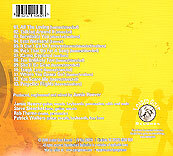 Walters' co-writes shine similarly: "Inevitable You," "It Can't Go On Forever," "Where You Gonna Go? ", and "Propeller Flights" are melodic gems, sung in tender voice by the man himself (although "Propeller Flights" finds Hoover taking the lead). Special mention must be made of "Where You Gonna Go? ", one of Eggs' best numbers, another great showcase for Thorne, who gives his snare drum quite the workout with a series of quick rolls and syncopated shots. A short, get-in-and-get-out band showcase, this is a number that gets the blood flowing at an accelerated rate. Scrambled Eggs is a hard hitting serving of your daily requirement of vitamin P, another sterling addition to the ear-popping, long-playing resume of one of pop's top bands. "Propeller Flights," Eggs' closing number, is arguably the shining moment amongst an album's-worth of brighter-than-bright lights. It shows the four members of the band working together like the brothers-in-arms that they are, serving the song with their strengths strategically placed behind Hoover's smooth lead vocal. The gorgeous melody is buoyed by sweet acoustic guitar, thumping bass, galloping drums, and a sad tale of a man who always keeps a quick escape in his back pocket, just in case love, or more pointedly, his perception of love, deserts him. What hasn't, and won't ever, desert the Spongetones, is the ability to craft records that speak to the worldwide community of music lovers. As the four continue to work together in this regard, the heavens sing for such gracious creations, and light the skies with hope that the next record won't be far behind.